We are called individuals for a reason. We each have our unique talents, strengths and passions. This makes us good at some things, and not good at others. 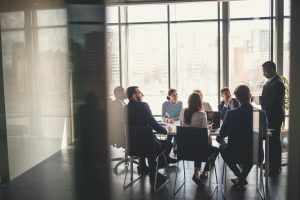 Sometimes, bringing people together who are all uniquely different can produce a winning combination, such as an executive team comprised of attributes like strategy, prowess, business acumen, personability and creativity. But sometimes, unique attributes found in some can cause defensive, combative, and resentful behaviors with others when those attributes are left uncontrolled and unmanaged. And when these behaviors exist unchecked in an executive team, the entire organization feels the effect. Tensions run high and performance is negatively affected at every level. The From Dysfunction to High Performance program* is designed for executive teams that may be experiencing unproductive conflict, unmanaged behaviors and business interruptions that need outside guidance to find a solution. The program addresses why the conflict is happening and guides the team through education, tools and individual coaching to shift to improved collaboration and productive performance. Each of these components are developed through guided practice and coaching to ensure all members of the executive team are aware of what is productive and unproductive about their personalities, work habits, interactions and communication. This creates the ability to become more self-managed, leading to improved relationships, expanded trust and greater performance. This program provides an unparalleled value to organizations with its ability to build a stronger, more cohesive and more focused executive team, that can more effectively spend its time on the needs, direction and opportunities of the business, instead of on unnecessary distractions that complicate the workplace for all employees. *The Dysfunction to High Performance program is also available for teams within an organization outside of the executive team. The Leading Edge for insights to help you gain your competitive advantage by developing your inner leader. The Power Within for inspiration to help you tap into your strengths and achieve your potential. The Coach’s Corner for guidance to help you shift from managing to coaching to amplify employee productivity, performance and retention.